Our Thai Oil Massage is a softer variation of the Traditional Thai Massage and uses natural, blended oils to give a lighter, smoother experience. We will start with warming up by applying pressure points along the body to increase the circulation. Applying the oil we will work our way upwards from the legs using long & short strokes to release the tension in the body. To finish the treatment we will apply towel compress to remove the oil and relax and calm the skin. With our Traditional Thai Massage pressure is applied using the palm and in some cases the thumb/elbow on specific points (called 'sen') in the body. These 'sen' follow the lines of the nervous system and have specific benefits when pressure is applied to them. We then move onto rhythmic pressing and stretching of the entire body. This may include pulling fingers, toes, ears, cracking knuckles, walking on the recipient's back, and moving the recipient's body into many different positions. Our Healing Thai Massage is focussed on releasing pain,stiffness and tension in your muscles, tendons and ligaments. We use thumb, hand and elbow to soften & relax whilst applying the healing Thai Balm to help them recover. In some cases where the muscle is especially stiff we use 'Muay' oil to warm and soften the area during the treatment. The perfect treatment for those who have pain from long hours sitting down as well as for athletes who are recovering from training sessions or injuries. Our Herbal Thai Massage is focussed on releasing pain,stiffness and tension in your muscles, tendons and ligaments. We use thumb, hand and elbow to soften & relax and after apply the healing Herbal Compress to help recovery. The Herbal Compress is a mixture of special Thai herbs which are steamed and applied warm to the skin as well as releasing an aroma which is inhaled and aids breathing and clears your airways. Our Swedish Massage is a soft variation which uses massage oil and soft, light strokes to gently caress and relax the body. A intensely relaxing massage which applies no pressure to the body but instead relies in the rythmic strokes to calm the body and mind from stress and anxiety. Especially suited to those who are new to the world of massage treatments and would like to experience our lightest and most gentle treatment. This is a relaxing massage therapy concentrating on the back, neck and shoulder muscles. The treatment is designed to relax and ease tension in the areas of the body where muscle problems most often occur. Especially beneficial for those who spend long hours sitting down and for those who suffer from back pain or who have issues sleeping well at night. Massage Oil is used and at times we apply Thai Balm for tight and stiff areas. With our Reflexology Massage we will apply specific small movements and pressure to the reflex points in the feet and ankle. Pressing and massaging these pressure points will in turn alleviate tension and unblock corresponding parts of the body leading to a sense of well-being. Especially beneficial for those who suffer from headaches and migraines and have problems sleeping. 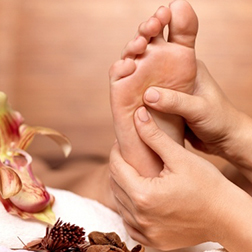 With our Foot Massage we will apply long and soft strokes to the feet and lower leg as well as using a wooden foot massager to activate certain pressure points. Pressing and massaging these pressure points will in turn alleviate tension and unblock corresponding parts of the body leading to a sense of well-being. Especially beneficial for those who suffer from headaches and migraines and have problems sleeping. Our Hot Stone Massage is focussed on releasing pain,stiffness and tension in your muscles, tendons and ligaments. We use thumb, hand and elbow to soften & relax and after apply the healing Hot Stones through pressing and placing on the body. The Hot Stones increase circulation and deliver the heat deeper into the tissues, giving a sedative effect to the nervous system promoting a deeper relaxation. Our Anti-Cellulite Massage will help to reduce the dimpling effect of cellulite around the legs and buttocks or stomach and arms. Using a special textured glove and by applying special essential oils we will massage, pinch and roll the skin in these areas to reposition the connective tissue to it's natural smooth state. Following this massage we will add a mask to the legs for 8-10 minutes, clean and add anti-cullulite cream. We start off by cutting and filing to shape the nails. 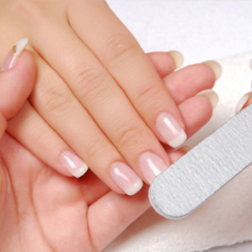 Moving onto the cuticles we push and cut to strenghten the nails which we then buff. Once the nails have been prepared we soak and then scrub the feet removing the hard skin. The feet are then washed and massaged with foot cream. To finish the pedicure we apply nail polish colour of your choice. After soaking the hands we cut and file to shape the nails. Moving onto the cuticles we push and cut to strenghten the nails which we then buff. The hands are then washed and massaged with hand cream. To finish the manicure we apply nail polish colour of your choice. After soaking the hands we cut and file to shape the nails. Moving onto the cuticles we push and cut to strenghten the nails which we then buff. The hands are then washed and massaged with hand cream. 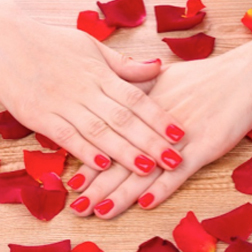 We use a warm wax method which works at a lower temperature and does not cause burning or skin irritation. The warm wax is applied and then paper strips are placed over which are then pulled off removing the hair. We start off by applying a cleansing lotion to clean and remove all make-up and impurities. We then apply a scrub to exfoliate the forehead, cheeks and chin before gently massaging the face with a special textured face-lifting glove. We then apply a mask to soothe, refine and soften the skin. We start off by exfoliating the feet,legs, trunk, back, shoulders and arms. 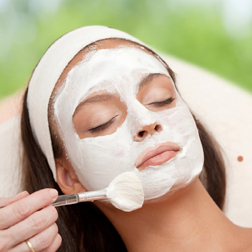 Once the skin is cleansed we then gently massage your body with special creams to slowly relax, calm and smoothe the skin. "I popped in to see if there was availability and was offered a session immediately (it was a Sunday). Pui (? Spelling) was so thorough, I was booked for an hour and it felt like longer! She found my knots and worked them out. I highly recommend Siam, as it was also a bargain on top of being a fantastic massage. I've been struggling to find a good masseur in London and found the best in Malta, and this was amazing! Highly recommended!" "I thoroughly enjoyed almost two hours in this spotlessly clean and relaxing environment. My excellent therapist administered a skillful back and neck massage, followed by a facial and I emerged into the afternoon sun in a zen-like state to enjoy a gelato in the park across the road. All this for €70 (ice cream not included!)" Please enter your email to subscribe to our official newsletter. Note: Your e-mail address will always be safe with us and will not be given to any third parties.